The guidebook covers several topics. In particular, we list a lot of useful sources for researchers to obtain suitable research data. In addition, several recommendations are given on how to correctly cite research data used in scientific papers. Last but not least the topic of data documentation (in the case of self-compiled datasets) is also addressed in the brochure. UK Data Archive (2011). Managing and Sharing Data. A best practise guide for researchers. Ball, A.; Duke, M. (2012). How to Cite Datasets and Link to Publications. Ball, A.; Duke, M. (2011). Data Citation and Linking. A Digital Curation Centre Briefing Guide. ICPSR (2012). 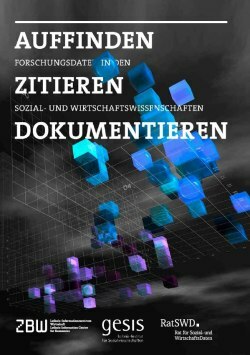 Guide to Social Science Data Preparation and Archiving. Best Practise Throughout the Data Life Cycle. …but we did not find a single guide in German. Therefore we decided to develop a guidebook for students and PhD-candidates in German. The guidebook is available on http://www.auffinden-zitieren-dokumentieren.de. We encourage all of our German-speaking readers to have a look at the guidebook and to provide us with your valuable feedback. Thank you!